(Updated at 4:30 p.m.) In preparation for Memorial Day, there’s a place in Arlington that might be worth a look — and it’s not Arlington National Cemetery. Thousands pass by it daily, but many don’t realize that the large, stone structure flanked by cannons across from Clarendon Ballroom (and near the Clarendon Metro station) is actually a war memorial. It was put up by the American Legion and honors Arlington citizens who died in combat, up through Vietnam. 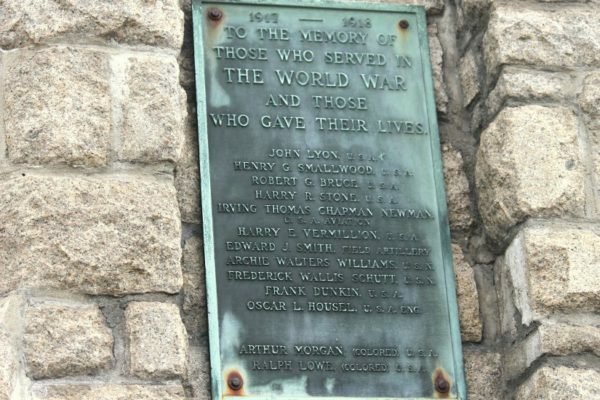 Of particular interest to historians is the World War I plaque on the side of the memorial, facing the intersection of Washington, Wilson and Clarendon Boulevards. Note that the last two names are separated from the others and have the distinction of “colored” listed in parentheses. County historians say this highlights the racial tensions at the time the plaque was made. However, a local resident with knowledge of the memorial’s history, who requested not to be named, says it wasn’t necessarily a sign of racial tensions. He said it’s simply representative of “how life was at that time.” There’s been debate over changing it, but the decision was made to leave the plaque as is. The plaque has remained this way during the memorial’s multiple moves. The original location was at Wilson Blvd and Highland Street, then Clarendon Circle, then Courthouse. It was brought back to Clarendon in 1986 and has been there ever since.